Orwin Manor will be on tour with the parade May 5-6 from 10 am to 6 pm and again the following weekend May 12-13 from 10 am to 6 pm. Morrone Interiors is proud to announce their entry into the 2018 Parade of Homes presented by the Greater Orlando Builders Association. 1520 Westchester is a personal home designed by Audrey Morrone that is ideal for entertaining and unwinding with guests or family. After seeing the 1925 villa that had fallen behind the times she wanted to be able to create her vision and return the home to its once grandeur self. The home is in the historic neighborhood of Orwin Manor, minutes from Park Avenue and Winter Park Village with easy access to I-4. 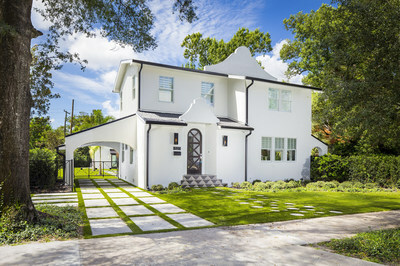 This stunning Winter Park villa has been reawakened and transformed into a fresh and contemporary living space. The 3,030 square foot home underwent a massive renovation with only a few original pieces of the home remaining, most notably the original hardwood floors which were refurbished with a black stain. In what was the original front stoop, a new foyer was created to welcome guests into a living room that features a stunning built-in fireplace, surrounded by custom cabinetry. The design team created an open floor plan to connect the dining room and the kitchen to create a truly gourmet space that included new cabinets, countertops of honed marble, and state-of-the-art appliances. This space has come to be a favorite for Morrone "I just love spending time down there, whether it's cooking up a fresh meal or entertaining guests, it's a really attractive and functional space that feels like the epicenter of the home." Following the glass staircase in the kitchen will lead you to the second floor, where the residence's bedrooms can be found. Just down the hallway is the owner's retreat – a private sanctuary that contains a sprawling master bathroom and walk-in closet. The master bathroom offers a quiet place to relax with a stainless steel Japanese soaking tub. The large, walk-in closet contains a boutique-style mirror to assist in finding the perfect outfit – and, for convenience – is also home to a washer and dryer.